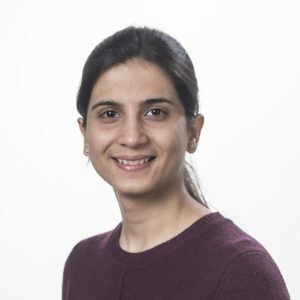 Sanu’s research focuses on exploring the natural diversity present in wild relatives of wheat with the objective of introducing novel genes/alleles into modern breeding varieties. She works with Aegilops tauschii, which is closely related to the D genome of wheat and carries a wide range of resistances to biotic and abiotic stress. To speed up cloning of resistance genes, Sanu has developed a new method, called AgRenSeq which combines association genetics with resistance gene enrichment sequencing on a genetically diverse panel to explore NB-LRR gene diversity. The method works great to clone resistance gene from Ae. tauschii panel and identify new sources of resistance to various diseases of wheat. Sanu is working towards implementing this method in different species to clone resistance genes, and previous work involved studying the genetic diversity present in Ae. tauschii and using SNP based genome wide association mapping to understand the genetic basis for variation in grain micronutrient concentration and grain size.